I’ve been working on a proof of concept for using claims-based authorisation with Windows Identity Foundation (WIF) against an Active Directory Federation Services (ADFS) 2.0 security token service (STS). System.Security.Cryptography.CryptographicException: The system cannot find the file specified. Looking at the stack trace it seems that Data Protection API (DPAPI which in .NET is exposed as System.Security.Cryptography.ProtectedData) is being used to encrypt data. A common use of DPAPI is to do encryption without you having to worry about key management: you leave it to Windows to worry about where the keys are stored. Those keys are typically buried in your user profile/registry somewhere – so it seemed odd DPAPI was being used here at all – the DPAPI keys would need to be part of the App Pool user account profile/registry. Sure enough WIF was using DPAPI to encrypt a token, but DPAPI was complaining it couldn’t get to the keys because there was no user profile for the App Pool identity, which in this case Environment.UserDomainName/UserName told me was “IIS APPPOOLDefaultAppPool” – and there was no such user profile directory under C:Users. Typically WIF tutorials use the ASP.NET Web Sites, which use Cassini for testing, which runs under the current user identity and therefore a user profile with its DPAPI keys will be loaded – which is why if you use the standard run throughs/demos you don’t come up against this issue. 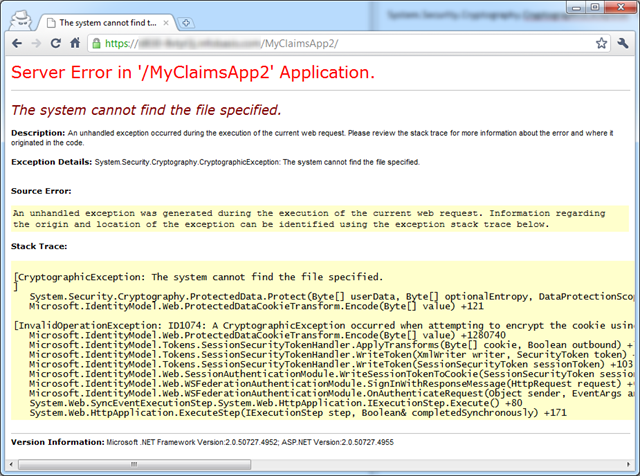 But if you run as a Web Application under “real” IIS, this is when you may hit this problem. It’s also debatable whether the use of DPAPI here is at all sensible. In a web farm environment the DPAPI keys for the App Pool identities across servers will be different, so if you don’t have sticky sessions enabled on your load balancer you run the risk of such federated logins not working 100% of the time. This issue is mentioned by Matias Woloski in the Geneva forums. Another case of bad defaults all round. Thank you, this article helped me! Brilliant… I was encoutering the error with a webservice and the extra bit of detail about iis7 was not included – may have helped some. Gotta love MS errors. On my test server I have loadUserProfile = False, and it still works. 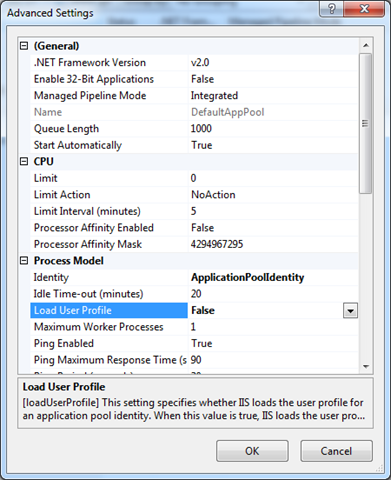 However the Identity option under the Process Model is NetworkService and not ApplicationPoolIdentity. If you have any comments on this, I would like to hear it. And Just want to add that this post helped us resolve our issue as well. Thanks!! Thanks for your help. I was thinking its related to the MachineKey folder permissions, but actually it was IIS.